Introduction: King Arthur represents a man who was the symbol of good against evil, light against darkness and never-ending struggle between what is right and what is wrong. Even though King Arthur is one of the best known legends, there are other characters that stand beside him and are very well known. Those are Lancelot, Guinevere, Lady of the Lake, Merlin and other, but also things like the Round Table, The Holy Grail, Camelot, and Excalibur. All of these things were worth of King’s struggle because they represent good side and they are worth of dying for. King Arthur is the King of England (Britain) and the throne is very much desired. 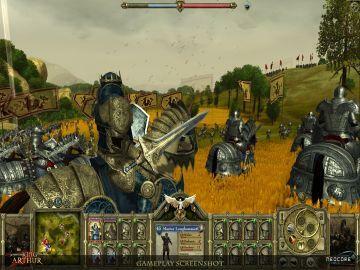 Gameplay: In order to get to the throne King Arthur must not longer exist. As the player you get a map which you use to navigate through a quest for justice and dominance. In order to stay in his throne King Arthur will need not just the sword in the stone, the lady in the lake or knights of the round table…he will need an army to vanquish an enemy. 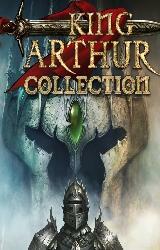 In this game you get hooked on guiding King Arthur to the throne quite easily, where you find yourself in the green fields of the country side. When the battle starts you will find yourself in a position where you’re going to make many decisions over splitting of your forces, navigation of terrain, defense of key locations and offensive moment. You can take tax for war funds, recruit army and so forth… As in each army, you are going to have a strong and weaker defense so you will need to balance them properly to success. 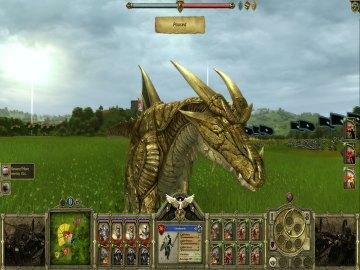 This game has many paths which you will need to follow and pass through and so find yourself in a position where you will need to make a decision for your character which will shape him into a great warrior along with his units which feature archers, axe men, cavalry and others and also with spell casting and supernatural elements. During the battle you can zoom in and you’ll feel like you are fighting. 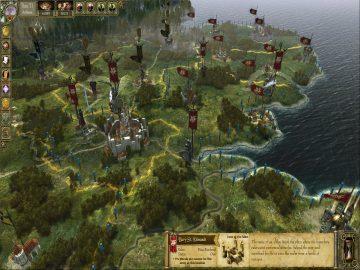 There is a single-player campaign where you take the role of King Arthur himself and you must work to unite all of Britain by using turn-based tactical moves on a map screen consisting of numerous provinces. Most of the times you will build up armies by recruiting men in towns you control, then you shuffle them around the map to attack rivals, and so you expand your kingdom. As said before, there is a variety of soldiers in your army and so they have different skills such as attack, defense, shooting, etc… Battles take place in a battlefield where two armies clash on the map and you control your troops and deploy them with basic formation commands. When you want to attack you can decide where the battle is going to take place, like in the forest, on a plain, hills and so on, and this counts because you get pluses and minuses to attack as well as defense calculations based on the terrain. Each battlefield has strategic spots that can be used to provide boosts to your army morale. In each battle there is a possibility for your soldiers to get hurt, but you don’t have to worry because there is an access to special healing abilities and spells. Map is also consisted of locations where after the battle which you have won, you get rewards and ways to emphasize the tactical importance of certain locations. They can be founded in different places like churches, Stonehenge and other places that any would try to seize. This brings us to another thing, where you can’t have just one battle but more. The enemy will try to seize different places at the same time, so you have to divide your army to fight the enemy, for example in three battles at the same time, but you also have to think about how to divide your soldiers, to maximize the efficiency in every battle both in attack and defense. This will require of you to calculate how many axe men, archers, cavalry, and so forth to send in each battle against the enemy. The enemy won’t have the same strength in all battles, so think about which army has more men to send to which battle so it doesn’t mean end to your army. The game offers many options making you decide for one side during the gameplay, like deciding for the squabbling brothers, searching for the Lady of the Lake, and so forth… This helps you to build great story but be careful because you may not be able to take as many of the scenarios. As the battle develops you can level up your army but also you’ll have to think about the enemy at the same time, because when you send for example 3-level army you’ll have to think about the level of your enemy. The battle can be fought manually or automatically. During manual battle you can win either by troops or capturing bases. Basic Troops have two formations, a loose formation that salters troops slightly and makes them harder to be hit by archers, but easy targets for cavalry. Closed formation on the other hand is good against cavalry, but can be hit by archers very easily. On the other hand, if you are in a difficult battle there are knights with their access to various spells and abilities which can turn your battle into victory. Every time you enter into battle you get different season. For example in Spring the map is repopulated with new quests and characters, in summer armies have 50% more movement points, in Autumn you get more food, and in Winter there are taxes from various locations and ability to build, but armies can’t move. However the main goal is to unite Britain and to do so you’ll have to conquer all the provinces and get points from them. Now, roleplaying is also well realized. You’re the legendary king with a team of Knights of the Round Table and they have special skills. On the other hand, there is a divine power which allows he casting of spells with effects that can blast enemies with meteors, heal allies, or send a fog; and with these you can get magical weapons. Quest locations are worked on the map. Some are about dealing with your rivals to the throne, while others are about myths, such as finding the Lady of the Lake. Actions are taken on a wheel of mortality that shows how good a ruler you are and a religious leader. You get points to become good ruler and leader, for example when you stand up for your friend, but also you can lose them if you betray your friend.